A couple of years ago I read an article describing the 2014 ESPY’s gift bag. One of the items that intrigued me was the Mogo Seat by Focal Upright. At the time I was venturing into standing desks. Standing in the same place for an hour at a time hurts though. I am not sure standing in the same spot was any better than sitting. When I saw the Mogo Seat it piqued my interest. 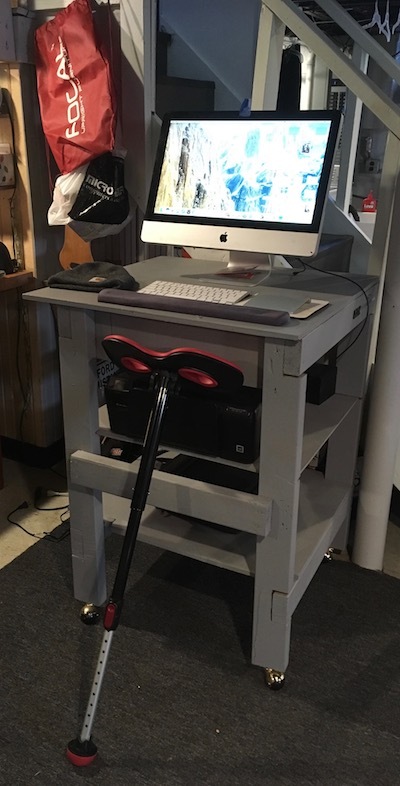 It appeared the Mogo Seat could give you the benefits of sitting while standing. I bought one. Its been two years of using the Mogo Seat and that means its time for a review. The Mogo Seat does what it’s designed to do. Provide support while standing. It has made being on my computer for extended times easier to do. It did receive some laughs (not from me) when it showed up at the house. When I put it together and demonstrated how it worked there might have been some looks like “why”. Versatility is what the Mogo Seat is about. I have not used it anywhere outside of my house nor has it left the space near my standing desk. It does not mean you could not take it with you to a sporting event, concert, parade, etc. where you could be standing for hours. At a minimum it could provide some relief as the seat is comfortable for 30 minutes. 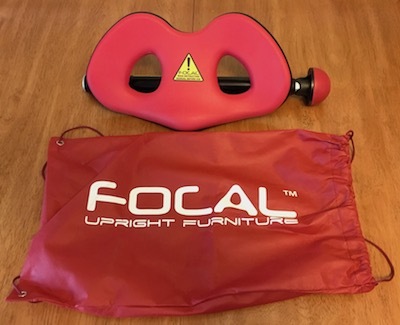 Focal Upright provides a bag for the Mogo Seat which makes for easy storage. Putting the seat together and taking it apart takes 30 seconds to do. Screw the seat into the pole and extend to your desired length. Do those steps in reverse to disassemble. There is a clip on the under side of the seat for the pole to attach to for storing. Change heights by pressing a lever which extends or contracts until the height desired. I am 5’10” and use the highest setting at a 50 degree angle. My needs and office area have changed since buying the Mogo Seat. The office is gone as both bedrooms are now occupied by toddlers. My 2010 iMac still works and I did not see a reason to sell it. But the dinner table is no place for one. Into the basement went the iMac. I bought a MacBook Pro for the dinner table where I do most of my work now. I only use the Mogo Seat when on the iMac. My sad excuse for a standing desk works for the amount of time I spend down there. A desk chair will not work with my standing desk as its right next to my workbench. For the 15 minutes at a time I might be typing the Mogo Seat works and then is easily moved aside. My kids play with it occasionally as it is a goofy looking thing. The Mogo Seat is a unique way to address the issues of sitting and standing. I don’t know if I’d use it at an office or traveling. I’m not a “things” type of person. The thought of having to carry it into a meeting or packing it up for a vacation has not crossed my mind once. In an office setting I could imagine this working if the company banned office chairs and gave everybody a Mogo. Otherwise it might be overkill for office furniture. I like it as my extra “chair” in the basement. Fold it up and put it away or keep it put together and plop down for 30 minutes. For $99 it was a good experiment and if I take a long-term approach I have used it more than I think. I cannot remember if I bought the Mogo Seat directly from Focal Upright ($99 with free shipping) or at the Focal Upright Amazon Store. Focal Upright Furniture makes a number of standing seats and desks. Standing is what they specialize in.